Welcome back to my Wednesday Updates! Most Wednesdays you can join me right here for a little blurb about what we have been up to lately! 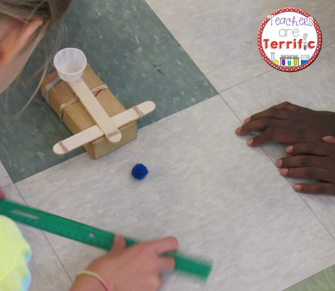 This week it's all about Catapults! This is one of the first STEM Challenges I ever tried and I pulled it out the other day and decided to add a little zing to it! It was already an experimentation and then design challenge, but I wanted to beef up the experimenting a little. The original plan was to have the kids invent their own experimentation. See the little cross beam. In that photo it is made of two craft sticks. Well, when given the freedom to test whatever they want, kids will right away, without thinking, add as many craft sticks as possible. I mean, up to ten sticks! The one above has about 5 sticks. Well, okay, you say, isn't that what they are supposed to do? 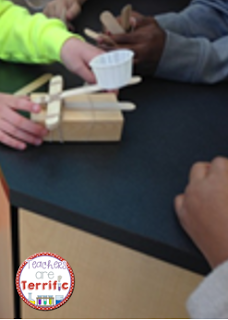 My plan was to have them test many different amounts of cross beam sticks and determine which amount produced the best angle for sending the projectile the greatest distance or for the highest height. This doesn't happen when they are trying to out-do one another with the LARGEST amount of craft sticks they can poke into their catapults. So, I revamped the data table and led the group through a plan of testing two sticks, then three, and so on. 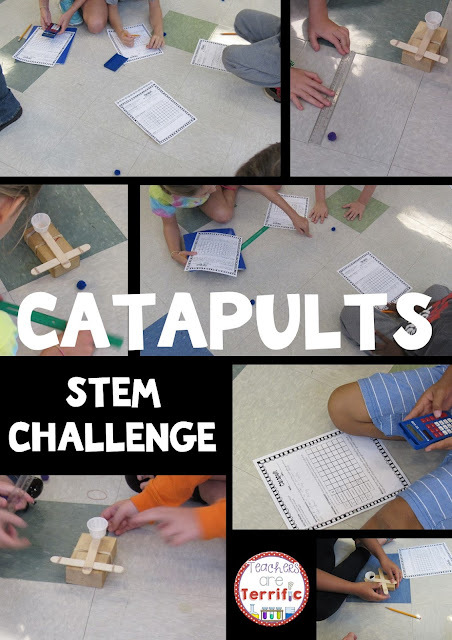 Eventually, they will use their data to build the best version of the catapult to complete some performance tasks! Here's some more fabulous shots! Do you love the one above! I DO! Look how closely they are working together and they are so engaged in this I don't think they even know it! 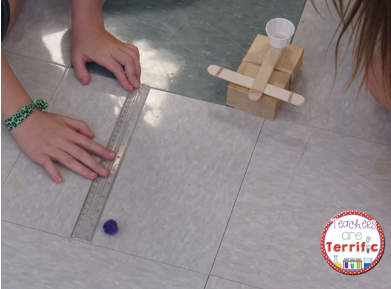 After measuring the distances the projectiles fly, the number is recorded and after five test flights the kids average the distances. Long ago I decided not to reinvent the wheel with measuring in this classroom. Those floor tiles are 12 inches. 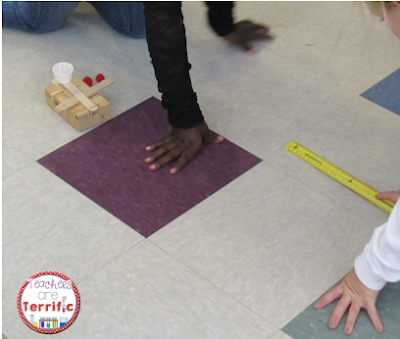 We use the tiles and only measure the partial tile distance. 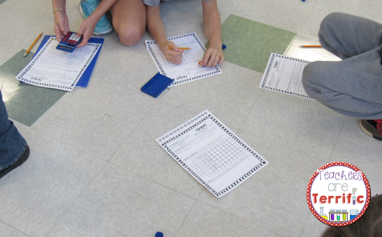 Look at the photo below to see kids measuring a partial tile. 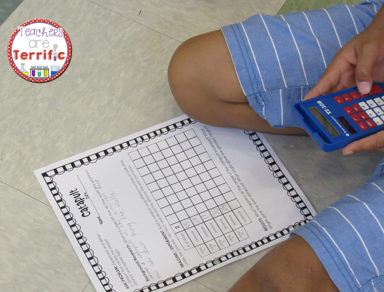 It uses a ton of math- measuring, addition, averaging, and using data tables. 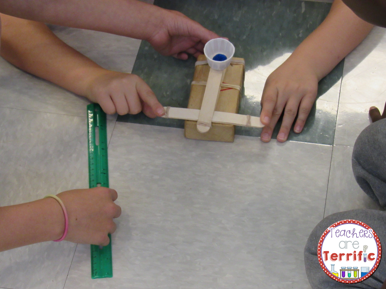 It follows the scientific method and the engineering design process. Join me next Wednesday for what we are doing in the lab!